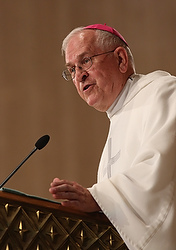 Following is Archbishop Joseph E. Kurtz’s schedule for the coming weeks. April 18 — 7 p.m. Holy Thursday Mass, Cathedral of the Assumption. April 19 — 9:30 a.m. Passion Play by seventh and eighth graders, John Paul II Academy; 7 p.m. Good Friday Service, Cathedral of the Assumption. April 20 — Noon, Blessing of Easter Baskets, Epiphany Church; 8:30 p.m. Easter Vigil, Cathedral of the Assumption. April 21 — 10 a.m. Easter Mass and Confirmation, St. Bernard Church, Liberty, Ky.
April 23-24 — Meeting with Metropolitan Bishops of Cincinnati and Indianapolis in Cincinnati, Ohio. April 24 — Noon Archdiocesan Secretaries Day Lunch, Pastoral Center; 7 p.m. Confirmation, Basilica of St. Joseph Proto-Cathedral. April 25 ­— 7 p.m. Confirmation for Incarnation, St. Lawrence, Mary Queen of Peace and St. Paul churches at St. Lawrence. 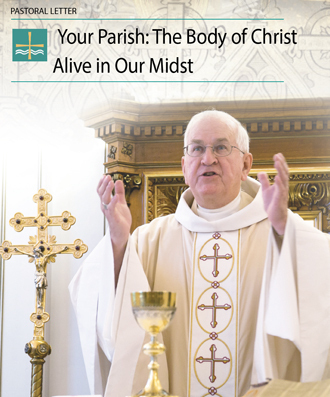 April 26 — 8 a.m. Mass, Holy Family Church; 7 p.m. Confirmation, St. Dominic Church. April 27 — 4:30 p.m. Confirmation, St. Leonard Church. April 28 — 9 a.m. CDT, Installation of Father Wilfredo Fernandez as pastor of Christ the Healer, Edmonton, Ky., and Christ the King, Tompkinsville, Ky.; 2 p.m. Confirmation for the Marion County parishes of St. Charles, Holy Cross, St. Francis of Assisi and St. Francis Xavier at St. Francis of Assisi Church. April 29 — 6 p.m. Knights of Columbus Kentucky Derby Charity Dinner. April 30 — 7 p.m. Confirmation for the parishes of Holy Rosary, Manton, Ky.; Holy Rosary, Springfield,Ky. ; Holy Trinity, Fredericktown, Ky.; and St. Rose in Springfield, at St. Rose.